Article: Worldwide Phenomenon DVICIO Looked Dapper At The 2016 Latin GRAMMYs! Worldwide phenomenon DVICIO took a short break from working in the studio on their highly-anticipated, masterpiece of a second album to attend the 2016 Latin GRAMMYs yesterday, November 17, 2016 in Las Vegas, Nevada. Adding onto all of their awe-inspiring and magnificent achievements, the immensely talented and stupendous band were nominated at this year’s Latin GRAMMYs for the category “Mejor Video Musical Version Larga,” which is the “Best Long Form Music Video” category. DVICIO band members: Andres Ceballos, Martin Ceballos, Alberto Missis, Nacho Gotor, and Luis Gonzalvo are all so hard-working, charming, and are such extraordinary and profound musicians and they truly deserve their nomination and all of their successes. DVICIO even took on the stage at the Latin GRAMMYs and blew everyone away with another spectacular and brilliant performance. In addition to all of the excitement from the night, DVICIO also presented at the award show. 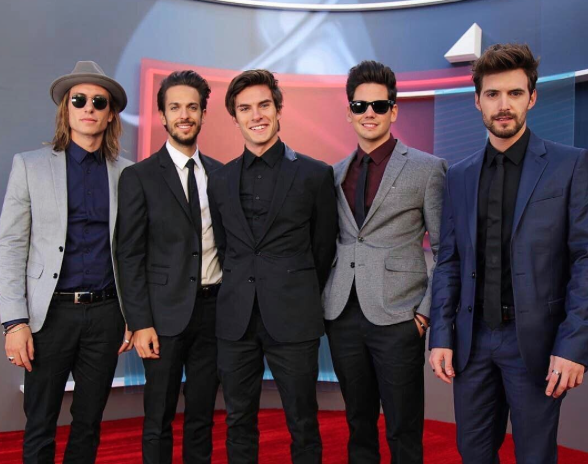 Let’s take a look at what the outstanding band-members of DVICIO shared on social media of their unforgettable time at the Latin GRAMMYs. With their impeccable talents, their life-changing performances, and their remarkable music, DVICIO is destined for continued successes and we love joining them on their phenomenal journey as they takeover the music world! Here at Alexisjoyvipaccess.com, I’d like to send a big congratulations to DVICIO on their Latin GRAMMYs nomination and for always leaving the world amazed with their terrific projects! Follow @dvicioficial on Twitter and @dvicio on Instagram, and follow @dvicio_andres, @dvicio_missis, @dvicio_martin, @dvicio_nacho, and @dvicio_luis on Twitter and Instagram. Check out my updated VIPAccessEXCLUSIVE interviews with DVICIO below! Previous Article: Get Ready To Jam Out To Some Live Music With MTV’s Monthly Music Series “MTV Live Setlist” Premiering Tomorrow 11/19!